For 2016, Hyundai's Elantra compact sedan continues to offer consumers an impressive dose of style, features and fuel economy, while simultaneously giving the competition migraine headaches. The handsome Elantra sedan carries on this year with little change, but the Elantra GT hatchback receives bold new styling plus features you won't find on a Honda Civic, Ford Focus or Toyota Corolla. Elantras: great car for anyone and everyone. My car is really nice, the interior is beautiful. I have had the car for two years and it still runs amazingly. The tires are the one thing I am not overly fond of as they have popped twice and needed the most work done on them. The car has an easy to read gasoline meter. It is reliable. It is a super comfy car, and the interior has held up with kids in the car and people spilling drinks and food products on the seats. It still looks amazing and it feels comfortable to drive in, especially on long distance trips. I am happy I bought this car and I would buy the newer model once I have paid off my current car. It is very reliable and I do not regret buying this car at all. It runs smoothly and everyone who rides in my car agrees on that matter. The trunk space is super spacious and can hold a large quantity of items inside of it. Another great advantage for vacations of long car rides where you never know what can happen. I would recommend this car to anyone and everyone. It is amazing and a really great buy. As stated the only thing I wish was different is the tires, I would prefer if they were more durable and could hold up over bumps and holes. Great value for the vehicle! I love my vehicle and I hope to have it for many years to come. I love that the dealer offers a 100K mile warranty and gap insurance. It really takes the pressure off when going on road trips to know if something happens, it is okay. I also love that I have a rear-view camera. It helps when I am in a crazy parking lot and I have already looked behind me many times and another vehicle decides they do not want to wait for me to back out of my spot and I can see them in the camera. I also love that the gas pedal needs to have a heavy foot. I am not a fan of cars that you lightly tap the gas and it goes! It really scares me. With this car, I do not have to worry about it. The only con I have had with this car is the tires. My mechanic told me they make soft tires. So I replaced them for more sturdy tires that don't get chips when I go over gravel or train tracks. The gas mileage, and the trunk space. I bought this car not really wanting a car at all. It was between this car and one other. I picked this one just to spite my husband. It sat in our driveway for almost a week before I drove it again. Then you couldn't get me from behind the steering wheel. We have taken it to Missouri once, and Louisiana twice, and gets great gas mileage. My husband got 45 miles to the gallon on one of our trips to Louisiana. I drive all over town once a month getting groceries. It also gets great gas mileage as well anywhere from 27 to 32 miles. I know there is probably a lot more that is great about this car, but I am not a mechanic. So all I know is what get out of it as far as gas mileage. 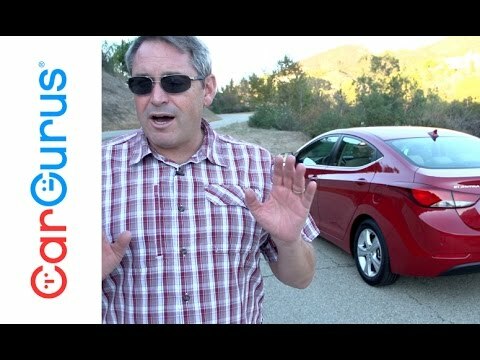 2016 Hyundai Elantra review and test drive. They’ve come a long way!